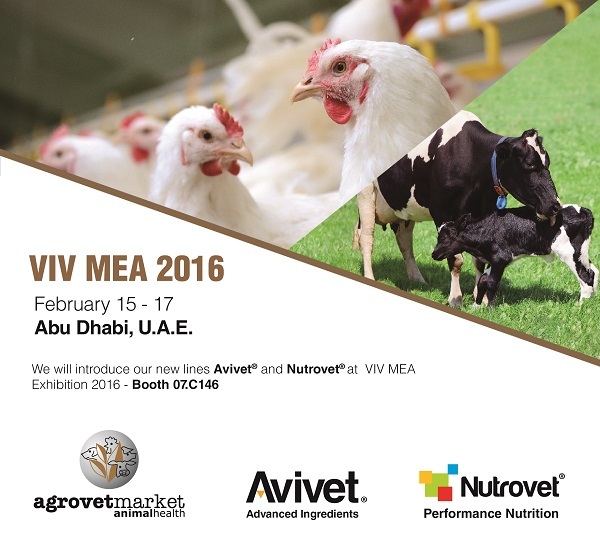 From February 15th to 17th, the VIV MEA 2016 will be held in Abu Dhabi. This great event gathers top companies from all around the world as well as renowned industry professionals dedicated to health and animal production. Agrovet Market is participating in this prestigious event and will make the official announcement of their new Lines Nutrovet®, Performance Nutrition and Avivet® Advanced Ingredients, both aiming the Poultry and Swine Division of the Company, focused in meeting the nutritional and health needs in the various challenges of modern production. Also, this international event will strengthen the presence of the company in the Middle East and Africa. VIV MEA 2016 revolves around the concept of “Feed to Meat” applied to poultry and livestock industry, inviting the audience to know and enhance the production chain, turning into an event of great interest among producers and end users. Agrovet Market Animal Health is proud to participate as a peruvian Company in this event and invites all professionals to be part of VIV MEA 2016.